The consumer Network Attached Storage (NAS) market has seen tremendous growth over the past few years. As the amount of digital media generated by the average household increases, 4-bay solutions based on ARM platforms are turning out to be quite attractive for home users. Low cost and power efficiency are some of the positives for these types of solutions. Synology targets the average home user market with the j-series models. These units have traditionally provided consumers with a very budget-friendly entry-level window into the DSM (Disk Station Manager) ecosystem. With drive capacities on the increase, we have seen people move to 4-bay NAS units in order to take advantage of RAID-10 (despite the loss of effective storage space). This helps to avoid (to a certain extent) risk-prone rebuilds associated with RAID-5 arrays. We have already evaluated solutions from Western Digital (WD EX4) and LenovoEMC (ix4-300d) in this space. In late April this year, Synology introduced the DS414j to provide consumers with an alternative in this market segment. Western Digital and LenovoEMC's solutions are based on Marvell SoCs, but Synology bucks the trend by opting for a Mindspeed Comcerto C2200 dual-core communications processor in the DS414j. 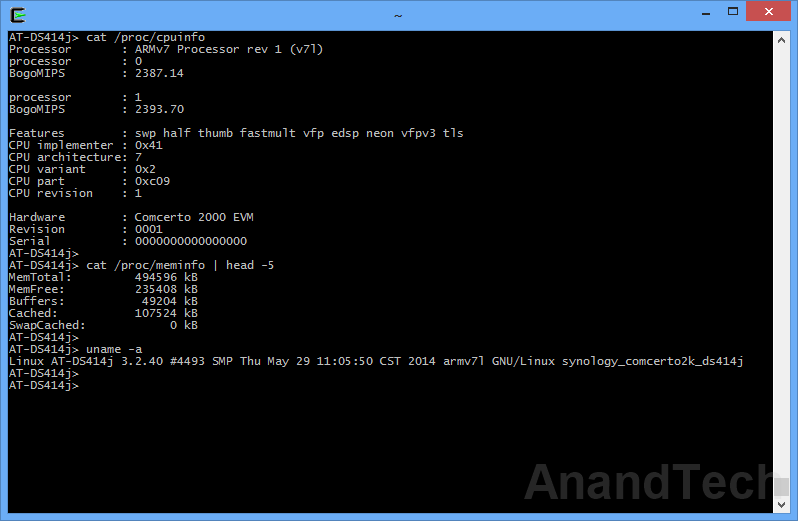 The SoC has two Cortex-A9 cores running at 1.2 GHz and plenty of hardware acceleration engines. The other specifications of the DS414j are provided in the table below. The DS414j runs Linux (kernel version 3.2.40). Other aspects of the platform can be gleaned by accessing the unit over SSH. 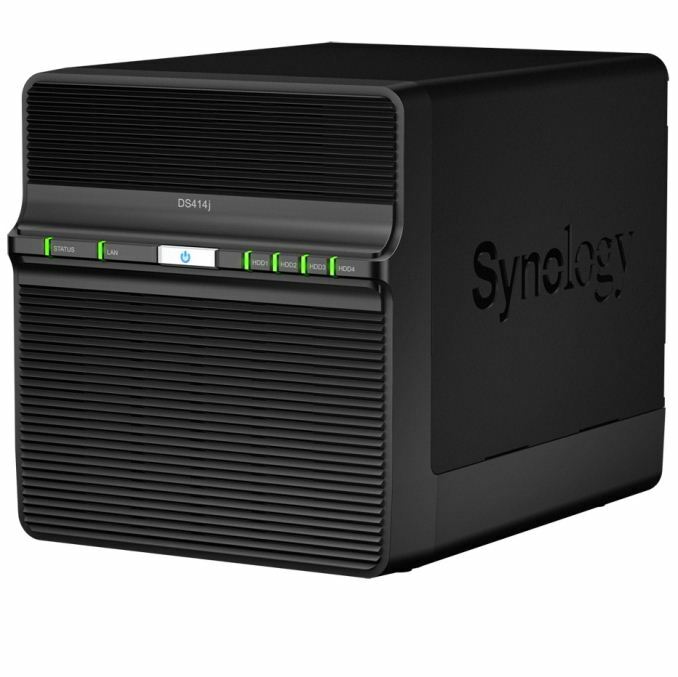 The Synology DS414j is a 4-bay unit. Users can opt for either JBOD, RAID 0, RAID 1, RAID 5, RAID 6 or RAID 10 configurations. We benchmarked the unit in RAID 5 with four Western Digital WD4000FYYZ RE drives as the test disks. Our testbed configuration is outlined below. Thanks to Western Digital for the two WD RE hard drives (WD4000FYYZ) to use in the NAS under test.